One day before today’s qualifying match for the 2014 FIFA World Cup Brazil between Slovenia and Brazil the Minister, responsible for economic development and technology, Stanko Stepišnik, MSc attended the business event for the sponsors of the Norwegian football team. 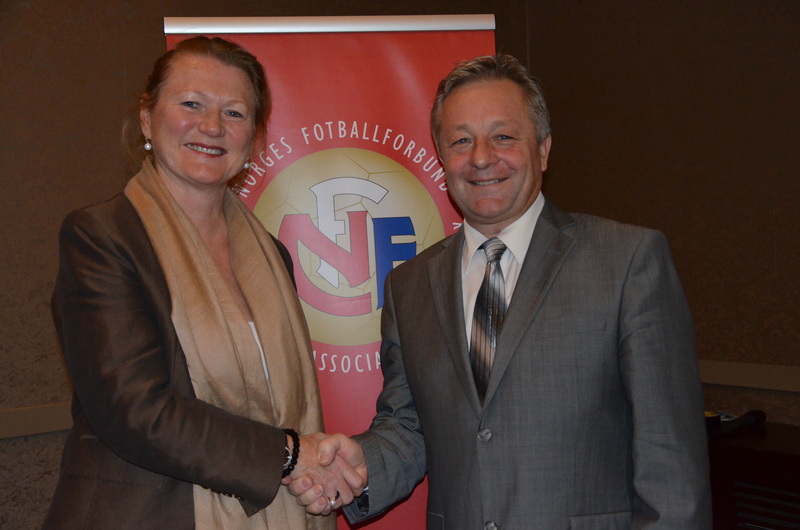 The Minister also met with the Ambassador of the Kingdom of Norway, responsible for Slovenia, Tove Skarstein. In his opening address the Minister underlined that the Kingdom of Norway and the Republic of Slovenia have established cooperation at an enviable level in several areas; mainly in the framework of the implementation of the Norwegian Financial Mechanism and the European Economic Area Financial Mechanism, which is a good basis also for the strengthening of economic cooperation. The Minister introduced to the Norwegian entrepreneurs the investment opportunities in Slovenia and underlined that Slovenia awards financial initiatives for foreign direct investments such as tax allowances as well as by allocating grants for initial foreign investment, financial incentives for employment and (re)qualification of employees, employment incentives, incentives for innovation projects (grants, soft loans, guarantees and various incentives at the local level). According to Minister Stanko Stepišnik, MSc the cooperation between Norway and Slovenia has solid foundations. The Minister expressed his confidence that new business ties will be established which will benefit both countries. In the morning a discussion, organised by the Embassy of the Kingdom of Norway, which took place in Maribor and dealt with the use of the funds under the Norwegian Financial Mechanisms and the European Economic Area Financial Mechanism, was held. Marko Drofenik, Director-General of the Regional Development and European Territorial Cooperation Directorate, and the representatives of the Norwegian football team also attended the discussion. In the framework of the discussion the project “DROM – POT”, which focuses on the promotion of social inclusion of the Roma population, was presented.